Irritable bowel syndrome, also known as IBS, is an often debilitating condition that causes abdominal pain, diarrhea and/or constipation. Since certain foods have been shown to aggravate or improve symptoms, it's a good idea to learn some methods to help reduce flare ups. 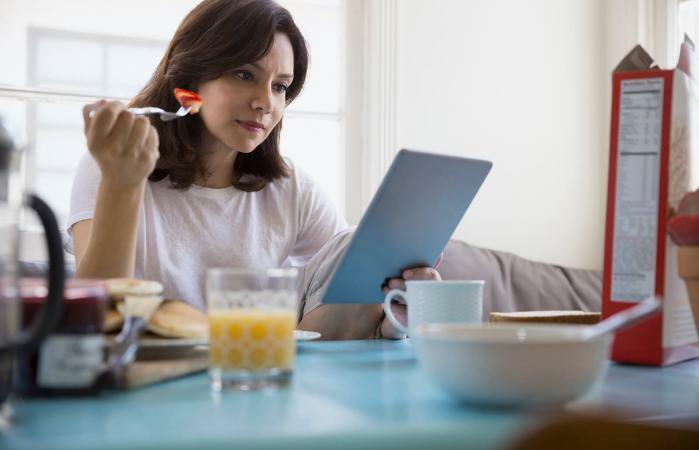 Following a specific diet for a health condition can help improve your quality of life by helping you identify food triggers in order to prevent symptoms from occurring. The following IBS diet sheets are intended to educate you about which foods are likely to worsen or improve your symptoms. Many gastroenterologists believe that IBS symptoms can be controlled by eliminating or greatly restricting these compounds in your diet and working to manage stress and stay active. 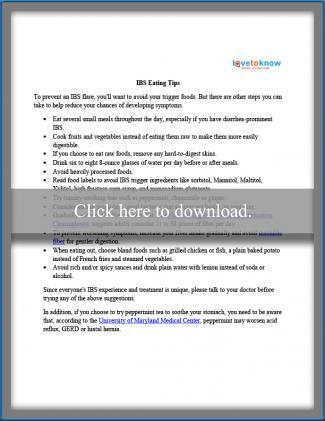 To download and print each diet sheet, simply click on the appropriate picture. You'll need Adobe Reader to view and print the sheets. If you don't have Adobe Reader installed on your computer, click here for a free download. 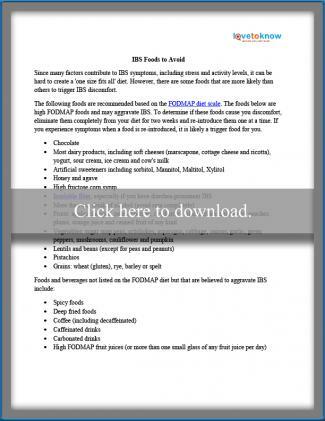 Download a list of IBS eating tips. This printable diet sheet lists foods that are most likely to cause uncomfortable IBS symptoms. Download a list of foods to avoid. This printable diet sheet lists foods that are IBS friendly and least likely to cause symptoms. 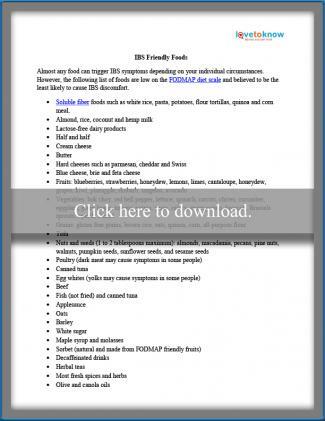 Download a list of IBS-friendly foods. To help you figure out what your food triggers are, keep a food journal by writing down everything you eat and any symptoms you experience. You'll need to keep the journal for a few weeks to figure out patterns in your body's reactions. Once you've identified which foods worsen your symptoms, simply eliminate those foods. For many people, IBS symptoms can be significantly improved through diet changes. However, it's still important to consult your doctor. Gastrointestinal discomfort can be symptom of other more serious digestive conditions such as celiac disease or Crohn's disease. Irritable bowel syndrome should not negatively affect your quality of life. Talk to your doctor about following an IBS-friendly diet to take back control and enjoy a happy gut.